I have been taking a pause this week from the hurried holiday preparations to spend some time with my family. 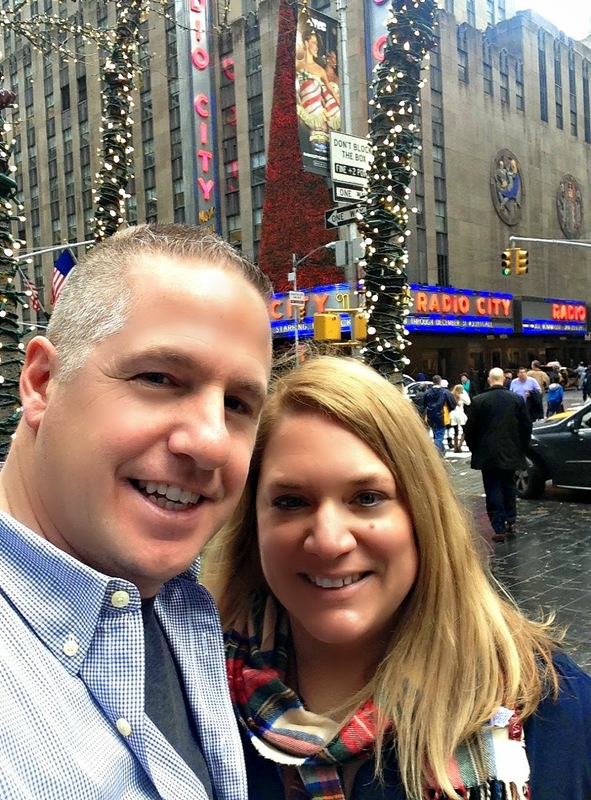 On Monday, we visited NYC for the Christmas Spectacular at Radio City. The weather was warm and balmy as we walked around the city with no jackets on. Today, there is lots of snow falling and we have a fire burning as we prepare food for tomorrow. It has been a crazy weather week. We are spending Thanksgiving at home this year. Billy is a police officer who is scheduled to work 3pm-11pm on Thanksgiving evening so we will eat our turkey when he comes home for his dinner break. I don't like to get into touchy subjects on my blog, but there has been so much negativity in the news about law enforcement as of late. I am so proud of my husband and the job he does. And that is all I will say about that. What a perfect day to spend in the city - I can't get over how warm it was! That's great that your husband will be able to have dinner with you during his break. Have a Happy Thanksgiving! I know, Shelley. It was weird leaving Radio City in the warm sunshine. I hope you Thanksgiving is wonderful! Enjoy the time with your family!! Have a wonderful Thanksgiving with your family. Glad your husband can come home for dinner with y'all. Thanks Tracey! Happy Thanksgiving to you!! You certainly should be proud of your hubby, Courtney. And that's all I'll say about that. : ) When we lived on Long Island, and our kids were younger, we used to go into "the city" every couple of years to see the Radio City show at Christmas time, the tree, St. Patrick's Cathedral and checking out the store windows. It is something I have missed doing. Even though we are all living in Ohio now, my daughter wants to experience that with my granddaughter so she is hoping to go next year. Happy Thanksgiving! My hubby is in retail so we will be having more of a Thanksgiving lunch tomorrow before he heads off to work (he's working all weekend). I think it is great that your daughter wants to visit NYC at Christmas! There is really nothing like it. I always tell my kids that we should take advantage of living so close to the city now so they have the memories, because we may not always live here. The tree wasn’t lit yet so we will probably go back again before Christmas. It was easy getting in and out of the city before Thanksgiving and tickets at Radio City were buy one get one. That will all change after today. I'm grateful for people like your husband who do the job they do--and families like yours who support them so they can. And that's all I'll say about that! ;) Have a lovely Thanksgiving dinner! Well said, Denise. And Thank YOU!! I am so grateful to have readers who come back here to read my blog and “get me”. Happy Thanksgiving! Mmany thanks to you for a lovely blog and my gratitude to your dear husband for being out there protecting and aiding all of us! Enjoy your day relaxing and enjoying those precious Golden Boys!! Happy Thanksgiving! Thank you so much, Lucy! Thanks to you for reading my blog!! Have a wonderful Thanksgiving! Happy Thanksgiving to you and your great family Courtney. I have been married to a firefighter for 33 years and I know all too well the holidays and them working. Your Hubby is a hero in my book. Putting their lives on the line to keep everyone safe makes them hero's to me. My son in law is a firefighter like my husband and my daughter a nurse so they will both be working the holiday today too. So we will do our Thanksgiving tomorrow to all be together. So happy your husband can come home for a dinner break to eat with all of you. Enjoy. I hope you and your family have a wonderful Thanksgiving. Your home is beautiful and I love that you share it with us. Best of luck to your sons as they begin their careers as police officers. The crazy hours and working holidays aside, my husband’s job has provided us with a great life as I am sure it will for your guys. Lovely post ! I support police officers 100 % and thank them for their service to us - what would we do without them ? Who else risks their lives for us every day ?? Thank you so much, Patricia. Your lovely comment made my (and my husband's) day!!! That is so pleasant to look at the people that are happy and have the family like that.